This article is about vacuum systems. For the fictional robot, see Getter Robo. For the usage of the term in object-oriented programming, see Accessor. For the electronic music producer, see Getter (musician). 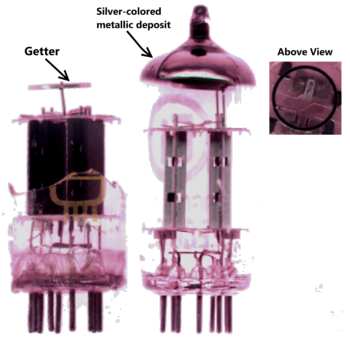 (center) A vacuum tube with a "flashed getter" coating on the inner surface of the top of the tube. (left) The inside of a similar tube, showing the reservoir that holds the material that is evaporated to create the getter coating. During manufacture, after the tube is evacuated and sealed, an induction heater evaporates the material, which condenses on the glass. A getter is a deposit of reactive material that is placed inside a vacuum system, for the purpose of completing and maintaining the vacuum. When gas molecules strike the getter material, they combine with it chemically or by absorption. Thus the getter removes small amounts of gas from the evacuated space. The getter is usually a coating applied to a surface within the evacuated chamber. A vacuum is initially created by connecting a closed container to a vacuum pump. After achieving a vacuum, the container can be sealed, or the vacuum pump can be left running. Getters are especially important in sealed systems, such as vacuum tubes, including cathode ray tubes (CRTs), and vacuum insulated panels, which must maintain a vacuum for a long time. This is because the inner surfaces of the container release absorbed gases for a long time after the vacuum is established. The getter continually removes this residual gas as it is produced. Even in systems which are continually evacuated by a vacuum pump, getters are also used to remove residual gas, often to achieve a higher vacuum than the pump could achieve alone. Although it weighs almost nothing and has no moving parts, a getter is itself a vacuum pump. Getters cannot react permanently with inert gases, though some getters will adsorb them in a reversible fashion. Also, hydrogen is usually handled by adsorption rather than reaction. Small amounts of gas within a vacuum tube will ionize, causing undesired conduction leading to major malfunction. Small amounts of gas within a vacuum insulated panel can greatly compromise its insulation value. Getters help to maintain the vacuum. Flashed getter – The getter material is held inactive in a reservoir during assembly, then heated and evaporated after initial evacuation, usually by induction heating. The vaporized getter, usually a volatile metal, instantly reacts with any residual gas, then condenses on the cool walls of the tube in a thin coating, the getter spot or getter mirror, which continues to absorb gas. This is the most common type, used in low power vacuum tubes. Non-evaporable getter (NEG) The getter remains in solid form. Coating getter – a coating applied to metal parts of the vacuum system that will be heated during use. Usually a nonvolatile metal powder sintered in a porous coating to the surface of the electrodes of power vacuum tubes, maintained at temperatures of 200° to 1200 °C during operation. Getter pump or sorption pump – In laboratory vacuum systems the bulk NEG getter is often held in a separate vessel with its own heater, attached to the vacuum system by a valve, so that it can be replaced or renewed when saturated. Ion getter pump – Uses a high voltage electrode to ionize the gas molecules and drive them into the getter surface. These can achieve very low pressures and are important in ultrahigh vacuum (UHV) systems. Flashed getters are prepared by arranging a reservoir of volatile and reactive material inside the vacuum system. Once the system is evacuated and sealed, the material is heated (usually by radio frequency induction heating). After evaporating, it is deposited as a coating on the interior surfaces of the system. Flashed getters (typically made with barium) are commonly used in vacuum tubes. The getter will usually be seen as a silvery metallic spot on the inside of the tube's glass envelope. Large transmission tubes and specialty systems often use more exotic getters, including aluminium, magnesium, calcium, sodium, strontium, caesium and phosphorus. If the getter is exposed to atmospheric air (for example, if the tube breaks or develops a leak), it turns white and becomes useless. For this reason, flashed getters are only used in sealed systems. A functioning phosphorus getter looks very much like an oxidised metal getter, although it has an iridescent pink or orange appearance which oxidised metal getters lack. Phosphorus was frequently used before metallic getters were developed. In systems which need to be opened to air for maintenance, a titanium sublimation pump provides similar functionality to flashed getters, but can be flashed repeatedly. Alternatively, nonevaporable getters may be used. Those unfamiliar with sealed vacuum devices, such as vacuum tubes/thermionic valves, high pressure sodium lamps or some types of metal-halide lamps, are often mistaken into thinking the flash getter deposit is caused as a result of the failure of the device. Note that contemporary high intensity discharge lamps tend to use non-evaporable getters rather than flash getters. Those familiar with such devices can often make qualitative assessments as to the hardness or quality of the vacuum within by the appearance of the flash getter deposit, a shiny deposit indicating a good vacuum. As the getter is used, the deposit often becomes thin and translucent particularly at the edges. It can take on a brownish-red semi translucent appearance and this indicates poor seals or extensive use of the device at elevated temperatures. A white deposit, usually of barium oxide indicates total failure of the seal on the vacuum system. as depicted in the fluorescent display module depicted above. The typical flashed getter used in small vacuum tube (thermionic valve) (seen in 12AX7 tube, top) consists of a ring shaped structure made from a long strip of nickel, bent up into a long, narrow trough and then folded into the ring shape with the trough opening facing upwards in the specific case depicted above. The trough is filled with a mixture of barium azide and powdered glass. During activation, whilst the bulb is still on the pump, an R.F. induction heating coil connected to a powerful R.F. oscillator operating in the 27 MHz or 40.68 MHz ISM band is positioned around the bulb in the plane of the ring. The coil acts as the primary of a transformer and the ring as a single shorted turn. Large R. F. currents flow in the ring, heating it. The coil is moved along the axis of the bulb so as not to overheat and melt the ring. Once the ring is heated the barium azide decomposes into barium vapor and nitrogen. The nitrogen is pumped out and the barium condenses on the bulb above the plane of the ring forming a mirror like deposit with a large surface area. The powdered glass in the ring melts and entraps any particles which could otherwise escape loose inside the bulb causing later problems. The barium combines with any free gas when activated and continues to act after the bulb is sealed off from the pump. During use, the internal electrodes and other parts of the tube get hot. This can cause adsorbed gases to be released from metallic parts, such as anodes (plates), grids or non metallic—but porous—parts, such as sintered ceramic parts. The gas is trapped on the large area of reactive barium on the bulb wall and removed from the tube. St 101 is 84% zirconium and 16% aluminium. In tubes used in electronics, the getter material coats plates within the tube which are heated in normal operation; when getters are used within more general vacuum systems, such as in semiconductor manufacturing, they are introduced as separate pieces of equipment in the vacuum chamber, and turned on when needed. It is of course important not to heat the getter when the system is not already in a good vacuum. ↑ O'Hanlon, John F. (2005). A User's Guide to Vacuum Technology (3 ed.). John Wiley and Sons. p. 247. ISBN 0471467154. ↑ Mattox, Donald M. (2010). Handbook of Physical Vapor Deposition (PVD) Processing (2 ed.). William Andrew. p. 625. ISBN 0815520387. ↑ Welch, Kimo M. (2001). Capture Pumping Technology. Elsevier. p. 1. ISBN 0444508821. ↑ Bannwarth, Helmut (2006). Liquid Ring Vacuum Pumps, Compressors and Systems: Conventional and Hermetic Design. John Wiley & Sons. p. 120. ISBN 3527604723. 1 2 3 Jousten, Karl (2008). Handbook of Vacuum Technology. John Wiley & Sons. pp. 463–474. ISBN 3-527-40723-5. Stokes, John W. 70 Years of Radio Tubes and Valves: A Guide for Engineers, Historians, and Collectors. Vestal Press, 1982. Reich, Herbert J. Principles of Electron Tubes. Understanding and Designing Simple Circuits. Audio Amateur Radio Publication, May 1995. (Reprint of 1941 original). Look up getter in Wiktionary, the free dictionary.